One category of jeans for tall women that you may not be aware of is designer denim. Trendy, top-of-the-line jeans are not only worn by average-size women, your long legs can fit into a pair as well. You just have to search a little harder. Designer jeans have been given celebrity status in today’s fashion world. The brands are unique. The styles are endless. And when you put on a pair you feel exclusive. But with so many brand name jeans out on the market these days, how can you find the ones which come in long inseams? Just take a look through the following list. 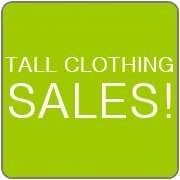 This brand name list will help you find tall jeans and pants in the latest fashionable styles. Recognizing the designers which make these longer length jeans will help save you time while shopping. To see a list of stores which carry designer clothing, check out my List of Designer Stores page. Shop for the brand names you come across here and you’ll be stylin' in no time!